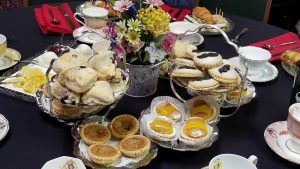 Michigan Steam Expo will be holding two Victorian Teas. These Teas will be brought to you by your favorite Tea Ladies, Ann Marie and Sue, so you know they will be wonderful. A ticket for the Victorian Tea is $30.00. There will be limited to 16 people each. You must be registered for the convention to attend the Tea. The teas will be 3 courses of goodies… each with it’s own course of tea to compliment the flavors of the food. The Victorian Teas are sponsored by Ackroyd’s Scottish Bakery. Shortbread: Traditional Scottish shortbread. This is the real stuff; NOT the cookies you find in the grocery store!